The dispute between Muslims and Catholics over the Mosque-Cathedral of Cordoba. Deep in the heart of Catholic Spain there has been a dispute that has lasted for centuries over a Mosque, the Great Mosque, or for others the great Cathedral of Cordoba, which carries on to this day. Once a small Christian temple, then a major medieval Islamic haven of worship, it was converted into a Christian cathedral in the 13th century. Helen Grady joins Muslim travellers on their journey to Cordoba – a focus of their Islamic faith on the European mainland despite a growing animosity towards them and banning of Muslim prayers at the site. Local activists voice their concerns over the renaming of the mosque the Cordoba Cathedral and accuse the Catholic church of ‘a land grab’. They claim the church is intent on erasing Spain’s long Muslim heritage and fear this will jeopardise the delicately balanced relationship between the two great faiths in Europe. 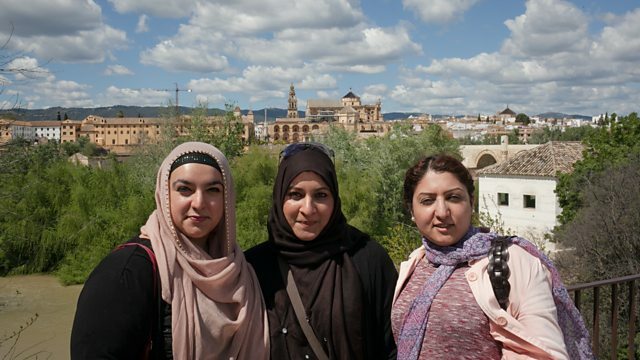 As Europe continues to debate its current relationship with Islam, Spain has attempted to position itself as a symbol of interfaith harmony and a major destination for Muslim tourism and business. However, Cordoba's Mosque-Cathedral has become a focal point for the increasingly fierce dispute over how Spain's Islamic past should inform its present and future. But for the people of Cordoba the beautiful imposing building is the focus of their deep faith where every day they come to pray to their God. It is through these ordinary people that Helen hears about the importance of the Mosque-Cathedral.